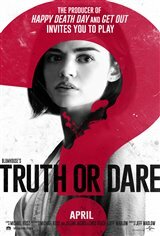 While playing a harmless game of "Truth or Dare" on vacation in Mexico, a group of friends realize that they've been lured into playing the game by Carter (Landon Liboiron), who met Olivia (Lucy Hale) and felt she was an easy target. He convinced her to get her friends together for the game because by luring them there to play, it means that he'll get to live. As he leaves, he warns Olivia that the game is real, and no matter where they go or what they do, the game will find them. He says if they want to live, they have to tell the truth and do each dare, or they'll die. The friends return home, but strange things begin to happen.